121A “How lucky was that?” … or a hint to the answers to the starred clues : WHAT ARE THE ODDS? In the world of statistics, the standard deviation (std. dev.) is a measure of how closely data points are clustered around the mean value. A low standard deviation indicates a relatively tight distribution. A standard deviation is usually represented by the Greek letter sigma in lower case. Whoopi Goldberg played Celie Harris Johnson in Steven Spielberg’s “The Color Purple”, the 1985 screen adaptation of the novel of the same name by Alice Walker. Kublai Khan was leader of the Mongol Empire from 1260 to 1294. Kublai Khan was a grandson of Genghis Khan. Kublai Khan had a summer garden at Kanadu, which famously was the subject of the 1797 poem “Kubla Khan” by Samuel Taylor Coleridge. A serenade is a musical performance in the open air, specifically at night. We tend to think of the term applying to a young man serenading his lover from below her window. We imported the word via French from the Italian “serenata” meaning “evening song”, influenced by the Italian “sera” meaning “evening”. Allen Ginsberg was a poet from from Newark, New Jersey whose name became inextricably linked with the Beat Generation of the 1950s and the counterculture of the 1960s. His most famous work is the 1955 poem “Howl”, in which Ginsberg denounces capitalism and conformity in the US. The dodo was a direct relative of the pigeon and dove, although the fully-grown dodo was usually three feet tall. One of the reasons the dodo comes to mind when we think of extinction of a species, is that it disappeared not too long ago (last recorded alive in 1681) and humans were the reason for its demise. The dodo lived exclusively on the island of Mauritius and when man arrived, we cut back the forests that were its home. We also introduced domestic animals, such as dogs and pigs, that ransacked the dodo’s nests. The dodo was deemed to be an awkward flightless bird and so the term “dodo” has come to mean a dull-witted person. The Arab League was formed in 1945 in Cairo with six founding members: Egypt, Iraq, Transjordan, Lebanon, Saudi Arabia and Syria. As a result of events during the 2011 Arab Spring, the Arab League has suspended Syria’s membership. José Maria Sert was a painter of murals from Catalan. He was a good friend of fellow-artist Salvador Dali. Mixed martial arts (MMA) is a full-contact combat sport in which competitors use a variety of techniques from a variety of traditional combat sports and martial arts. Although there were several groups known as the Illuminati, the reference is usually to the Bavarian Illuminati founded in 1776. It was a secret society, and as such was the subject of many rumors and conspiracy theories, which eventually led to the Illuminati being banned by local government and the Roman Catholic Church. Famously, Dan Brown featured the Illuminati in his best-selling 2003 novel “Angels & Demons”. Pretoria is the executive capital of South Africa (RSA), and one of three capital cities in the country. Cape Town is the legislative capital, and Bloemfontein is the judicial capital. Don Ameche was such a gentleman. He starred in the fun movie “Trading Places” in 1983, and was required to use the “f-word” in the script. According to co-star Jamie Lee Curtis, Ameche went around the set before the scene was shot, and apologized in advance to everyone for having to use bad language. In ten pin bowling, a split takes place when the number-one pin (headpin) is a knocked down with the first ball and two or more non-adjacent pins are left standing. The most difficult split to deal with is the infamous 7-10 split, where just the rear pins at the extreme right and left remain standing. Ramadan is the ninth month of the Islamic calendar, and is traditionally a period of fasting. The faithful who observe Ramadan refrain from eating, drinking and sexual relations from dawn to dusk everyday, a lesson in patience, humility and spirituality. A football referee is sometimes called a “zebra”, a reference to the striped shirt that is part of the official uniform. In modern usage, an ivory tower is an environment focused on education and intellectual pursuits while isolated from the practicalities of everyday life. The term is often used to describe academia. “Ivory tower” originated in the Song of Solomon in the Bible with the the line “Your neck is like an ivory tower”. In Spanish, the “hermana” (sister) of your “padre” (father) is your “tia” (aunt). Mother Teresa was born in 1910 in the city that is now called Skopje, the capital of Macedonia. At birth she was given the names Agnes Gonxha Bojaxhiu (“Gonxha” means “little flower” in Albanian). She left home at the age of 18 and joined the Sisters of Loreto, and headed to Loreto Abbey in Rathfarnham in Dublin, Ireland in order to learn English. Her goal was to teach in India, and English was the language used there for instruction by the nuns. After Mother Teresa passed away in 1997 she was beatified by Pope John Paul II. She was canonized by Pope Francis in 2016, and is now known as Saint Teresa of Calcutta. The marvelous series of “Our Gang” comedy short films was also known as “The Little Rascals”. The series was produced by Hal Roach starting in 1922, and running up until 1944. There were 220 “Our Gang” film shorts made in all, and one feature film title “General Spanky” released in 1936. Opus Dei is a Roman Catholic institution that was founded in Spain in 1928, and officially approved by the church in 1950. In 2010, Opus Dei had over 90,000 members, mostly lay people. The institution’s mission is to promote certain aspects of the Roman Catholic doctrine. Opus Dei was portrayed as a sinister organization by Dan Brown in his novel “The Da Vinci Code”. 25 Auctioneer’s cry : SOLD! 46 “I dare you!” : DO IT! 121 “How lucky was that?” … or a hint to the answers to the starred clues : WHAT ARE THE ODDS? 79 “How fancy!” : OO LA LA! 102 “Later, luv!” : TA-TA! 115 Swatting sound : WHAP! 117 “Jeez, that’s hot!” : YEOW! 123 “No, you shouldn’t have” : TSK! Bill: you have Saturday solution for Sunday’s puzzle. That’s a big “oops”. Sorry about that. All fixed now. Thanks for taking the time to point out the problem. 58:53. Quite a struggle, but I survived. Very impressive theme – at least in terms of creating it. 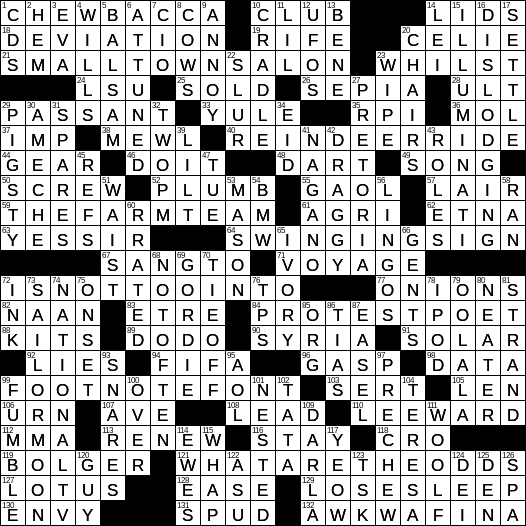 I could only sense the theme while doing the puzzle. I had to look at the NYT blurb last night to see the whole thing. I saw E Agard as the setter, and the puzzle did not disappoint. IS NOT TOO INTO IT has got to be a debut answer. I kept racking up vowels there, and I assumed I had made a mistake somewhere until I saw it. 24:19, no errors. An astonishing feat of construction! Got the theme early on, which was a big help. 1 hr 17 min. No errors. “Sorta” got the theme but didn’t quite get it until Bills explanation. Tough one but we got it. About an hour and 20 minutes. No errors. Did not really get the theme until I got here which makes the whole no error thing kind of a fluke! 58:19, 2 errors on a couple pieces of nonsense I couldn’t decipher. Another waste of a puzzle filled with Shortz’s manufactured difficulty.